Bernice W. Johnson, 93, passed away at his home on Friday, September 11, 2015. A graveside service will be held at 10:00am Monday, September 14, 2015 in the Tuscola Cemetery, directed by Fry~Smith Funeral Home, Tuscola. Bernice was born on November 18, 1921 to Arthur and Belle (McMillon) Johnson in Taylor County. He attended school in Southern Taylor County, finishing his GED while serving in the Merchant Marines. Bernice joined the Merchant Marines in 1944 and served as a 3rd Mate until the end of World War II. He returned to Texas and went to work for El Paso Natural Gas. While working for El Paso Natural Gas, he was transferred several times in Texas and New Mexico. 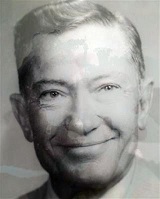 It was in New Mexico that he met and then married Charlda (Egger) on July 19, 1949 in Lovington. After thirty-one years with El Paso Natural Gas, he retired to Sweetwater. In 1983, he and Charlda moved to Tuscola. He is survived by his nieces; Anita Dison and husband David of Abilene, Carolyn Teten and husband Richard of Abilene, Nancy Eeyotch and husband, nephew; Lloyd Rinehart, and special cousin; Easter Belle Hothan. Also surviving Bernice is his large extended family. Bernice was preceded in death by his parents; wife, Charlda Johnson (2009), two brothers; Lloyd and Kenneth Johnson, and one sister; Miram Rinehart. In lieu of flowers, donations may be made to your favorite charity . Condolences may be left at www.fry-smith.com.